Robogals is a society at the University of Sussex. Robogals is part of a global organisation with many chapters around the world in places such as the Asia Pacific, Europe, Middle East, Africa, North America. We are student led and run by volunteers with the main aim of inspiring more children especially girls to pursue engineering and STEM related subjects. Currently in the UK women only represent 11% of the engineering workforce and we hope to change that. In our workshop we will be teaching kids how to programme and use our Lego EV3 Mindstorms. 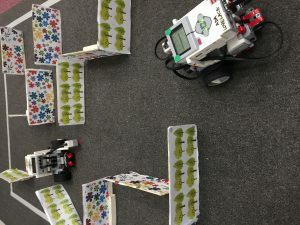 Using the lego EV3 Mindstorm robots we will be navigating mazes and learning how to line follow. We will also be bringing our NAO robots along which are autonomous robots designed to act and respond like humans. Our NAO robots can hold a conversation, wave, lie down and even do Tai Chi. Join us to learn more about robotics and also to get an insight into STEM (Science,Technology,Engineering,Maths) subjects.